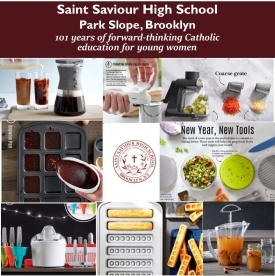 Thanks to Alumna Stephanie DiBrienza ’05, Saint Saviour is hosting an online Pampered Chef Party from March 1- March 31 with a portion of the proceeds going towards our Alumnae Scholarship! Currently, there are four $1,000 scholarships that are given out to students. We would like to increase this amount and your purchase will help us raise money for our alumnae scholarship. Thank you in advance for helping Saint Saviour High School!! Please make sure use the following link when you shop on Amazon! Need or Want a new school ring? Achieva Recognition Products, makers of our beautiful school ring, are offering alumnae the opportunity to re-order their school ring if they lost it or want to replace it. Please contact Ivan Possner at 732-583-5820 or ivanposs@gmail.com for more details and pricing. Price of ring varies depending on year of graduation (if new molds must be made since we have custom rings). Purchase your alumnae magnet today! 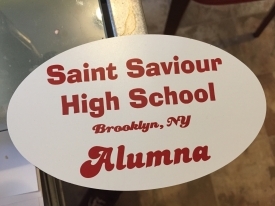 Saviourites - get your alumnae magnet today! $6 includes shipping. Named in honor of Saint Saviour High School’s largest estate donation, the Margaret Mary Wolfe ‘37 Society celebrates and recognizes Saint Saviour High School’s donors who have expressed their long term commitment by including Saint Saviour High School in their will. The most important benefit you will receive from joining the Margaret Mary Wolfe ‘37 Society is the happiness resulting from making a long-lasting gift towards the success of Saint Saviour High School. Once you complete your estate plans, please let us know so we can include you in this club. Please contact Christine Bove ’95 at 718-768-4406 ext. 7007 or bove.c@stsaviour.org.